Retail buyers: We grow trees from 36 inches tall and up for retail sale. We are California certified and have shipped successfully as far as California and Texas from south Florida. However, please note that we cannot ship if the destination temperatures are near freezing or over 85 degrees F due to possible damage and loss en route. PLEASE NOTE that we do not sell Rainbow seeds, nor do we sell any trees smaller than indicated above. All our illustrations of smaller trees are for educational purposes only. To see how securely we pack your tree prior to shipping to you, Click here! While our production nursery is not open to unscheduled visitors, we welcome retail customers and will arrange for shipment, delivery, or pickup by appointment after verifying that we have the quantity needed for the order. NOTE: If you have emailed us recently about trees and not heard back from us, please email again. We have been experiencing issues with our email and have ended up losing some Rainbow mail as a result. If you live in California and are wishing to purchase a larger Rainbow in the 10 to 15 foot tall range, you can call Lonnie Salinas of Arborscape at 1-951-588-7354 or email him at Arborscape. He is starting to grow larger Rainbows and may have some ready for sale by Fall of 2013 or Spring of 2014. Also give him a call if you wish to have large trees contract grown for you. Keep in mind that his business is independent of ours and so you must deal with him directly rather than through us if you are in the market for large Rainbows and live in California. The first step for retail customers is to submit an email to us including your name, organization name (if applicable), complete address, phone (very important! ), and email address, as well as the quantity you wish to order. We will then send you a return email detailing our current availability, as well as packing and shipping costs, if applicable. If you want to be sure to receive our email reply, you need to designate our email address as a "friend" or "contact" in your spam filtering program so that our reply does not end up blacklisted or discarded before you see it! PLEASE NOTE that we accept payments and deposits via PayPal. You may use your credit card via PayPal, but we are unable to take credit card payments directly. 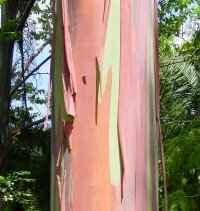 Click Here to Email for Rainbow Eucalyptus! Click Here to Email for General Inquiries. IMPORTANT EMAILING NOTES: We have had instances where people emailed us, we replied right away, and we never received a reply back. One way this can happen is that our email reply ended up in their spam or junk folder and/or was deleted as spam. To be sure to get our reply email, make certain that our email address is designated as a "friend" or "contact" in your spam filtering list! Also, if you use a proprietary email such as AOL's internal email system, MSN, or webmail services, you cannot use the email links above to open a "compose" window for those options. Instead, send your request to AROIDIAN (at) att.net from within your AOL or other proprietary email service. We grow our trees in Superoots Air-Pots, and the trees can range from 36" to over 5 feet tall, depending upon the time of year and the demand on our production. The trees 3 feet to 4 feet tall (our standard shipping size) retail at $60 each plus a packing and shipping charge which will vary according to the location being shipped to. Generally, the packing and shipping charges range from $35 to $45 per tree, based on current UPS Ground shipping or USPS Priority Mail rates plus the packing required to insure safe arrival to your door. If you wish your tree(s) shipped by another carrier, such as FedEx, or another rate, such as next day air, you must arrange with us via email before making the purchase. We can also deliver locally in the south Florida area for a small charge and we do sell our trees at selected plant sales and shows in south Florida throughout the year, stock permitting. Payment for these trees is made via PayPal; once payment is received, we will schedule shipment of your tree(s). Note: During the hot days of summer, we can ship only via USPS Priority Express because any other carrier takes too long or costs too much to get the tree to you in a timely manner. If demand is very high, we may obtain and offer for sale trees grown by other nurseries. These trees will be grown in conventional pots but will be selected to meet our high standards for health and survivability. In most cases, these trees are available only to customers who are able to pick up their trees in person at our location. Just prior to shipping, we remove and retain the Air-Pot for reuse and either bag the root ball securely in a heavy plastic bag or place it in a standard nursery pot. In either case we recommend strongly that you be prepared to install the tree in the ground as soon as possible after you receive it. We do not recommend planting the tree in a standard nursery pot unless it must be kept for a week or so before planting. If the tree needs to be kept longer, please consider purchasing an appropriately sized Air-Pot for this use so as to retain the benefits the tree received from being grown in an Air-Pot. Why do we price by tree size rather than by pot size? Well, unlike trees grown in standard nursery pots, the quality and value of an Air-Pot grown tree cannot be determined from pot size alone. For example, if you were looking at a 7 foot tree in a 3 gallon standard nursery pot, in all likelihood that tree would be overgrown and might have significant root circling. That tree would be of lesser value than one 3 feet tall grown in a 3 gallon standard nursery pot. By contrast, a 5 foot tree in a 3 gallon Air-Pot is a stronger tree with a denser radial root system and thus is of greater value than a 3 foot tree in a 3 gallon Air-Pot. We do everything we can to insure the safe arrival of your tree(s) to your destination. However, since what happens in transit and after arrival is entirely beyond our control, you, as the buyer, must assume all responsibility for the survival of the tree once the carrier accepts the shipment. We welcome your retail email inquiries at any time and will respond with our current availability. In the event that we are completely out of stock, we will announce that here and also will post the projected date when we expect to have more stock. The times when shipping will be either delayed or not available is when destination temperatures are near freezing either day or night, or are over 85 degrees F.
Wholesale buyers: At present, we do not stock sufficient quantities of trees to offer wholesale pricing. However, we will consider contract growing trees for your next landscaping project or community. If you have any other questions about our trees that are not answered here, please email us with your query. Also remember that we are not set up to sell to the walk-in trade, so you must place your orders and do your communication through email or telephone. Your satisfaction is our primary concern, so to help you succeed with your plants, please review the information provided on this site to guide you in cultivating them. If your question is still not answered, feel free to email us and we will do our best to help. These trees are generally free of pests; the most common problems are too little water and too much fertilizer (i.e. a granular feed). Keeping your tree soil moist at all times is extremely important for Rainbows. When repotting, be sure to support the root ball with open hand around the stem area and tapping around the rim of the pot rather than pulling on the stem to get the tree out of the pot. Pulling on the stem to remove the tree from the pot can result in serious root injury. Since the conditions under which you are growing are beyond our control, the only guarantee we can offer is that our trees are genuine Rainbow Eucalyptus (Eucalyptus deglupta) and that they are in a healthy and growing condition at the time the shipment is accepted by the carrier (or, in cases where we are delivering in person, when you physically take delivery).